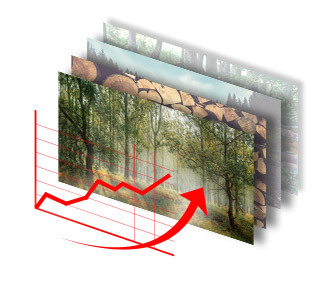 Eurostat PRODCOM data reveals that the total value of wood doors supplied to the EU increased by 5% to €7.12 billion in 2017. Despite the increase, the value of wood doors supplied to the EU in 2017 was still more than 25% down on the level prevailing before the global financial crises. Most new wood door installations in the EU comprise domestically manufactured products. The EU’s domestic production increased 4.9% to €6.78 billion in 2017. There was significant variation in the performance of the wood door sector in EU countries in 2017. Production in Germany, the largest wood door manufacturing country, was stable at €1.30 billion during the year while production in the UK continued to slide, by 2% to €840 million. However, production increased sharply in Italy (rising 12% to €910 million), France (rising 5% to €640 million), Spain (rising 14% to €540 million), Poland (rising 10% to €510 million) and the Netherlands (rising 30% to €250 million). 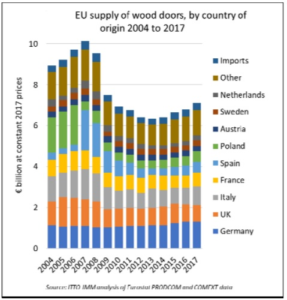 Wood door imports into the EU increased by just 0.3% to €341 million in 2017. 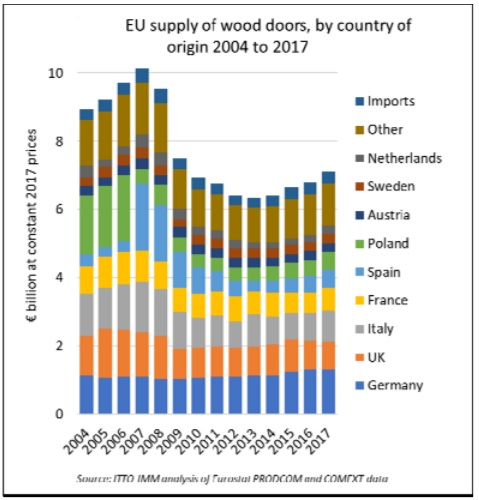 Imports accounted for 4.8% of the total euro value of wood door supply to the EU in 2017, down from 5.0% the previous year. Most of the gains in EU door imports in 2017 were from other temperate countries including Norway (+7% to €16 million), South Africa (+16% to €12 million), Bosnia (+29% to €7 million) and Ukraine (+50% to €7 million).